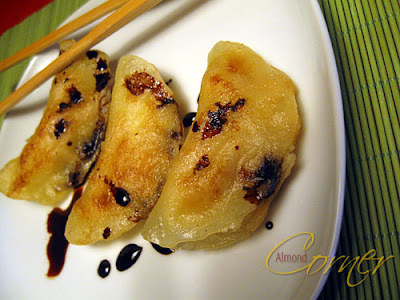 Almond Corner: Jiaozi: the first tiral! 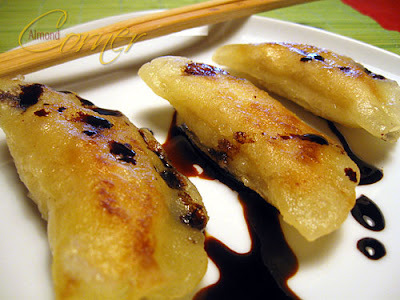 The pot sticker, Jiăozi (Chinese transliteration), gyōza (Japanese transliteration), is a Chinese dumpling, widely popular in China and Japan. Jiaozi typically consist of ground meat, vegetable filling thinly rolled into a piece of dough. However these should not be confused with wonton, because jiaozi have a thicker skin and are flatter. The dough for the jiaozi and the wonton wrapper contains different ingredients. 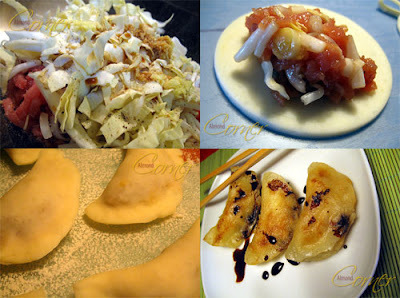 Jiaozi can be divided into various types, depending on the prepartions: there are boiled, steamed and fried dumplings. The Cantonese style is called dim sum, these are smaller than jiaozi and wrapped in a thinner translucent skin, and usually steamed. If you want to sink in the world of dumplings, you find loads of informations here. I simply adore these dumplings, any kind of them, so I decided to try to prepare myself. It is a huge and beautiful dumpling jungle, and I am standing at the border, but I am ready to take the first step to go in there. In fact yesterday I had my first trial, and I am not sure how to call these, but they were delicious and motivating to take the next step! Mix wheat starch, maize meal and lard, add boiling water and with a help of a fork mix it. Knead a smooth dough and form a roll. Slice the roll and roll out, as long as it is warm!, cut out circles and fill each (for the filling simply mix all ingredients together), fold and when ready, heat oil, fry them from both sides, pour about 100 ml water on it, cover until water is evaporated and fry some more minutes. Great! I love the fried version (my favorite)! Very yummy looking! müsste ich mögen, hab ich aber noch nie gegessen.